Summer visitors to the Algarve could be forgiven for thinking that rivers simply don't exist there. Except for the River Guadiana which flows into the sea on the Portuguese-Spanish border, and the River Arade which is crossed by a number of bridges near Portimao, the motorway bridges cross river valleys which are totally devoid of flowing water. Although few river flows are detectable on the coast during summer there are a number of rivers which have considerable quantities of water in autumn and spring when the Algarve can experience rainstorms of epic proportions. Nearly all the Algarve rivers are dammed to fill reservoirs (barragems), or heavily abstracted for use in farming, holiday developments and for other tourist attractions such as golf courses, and swimming pools. While some of the larger rivers may be able to retain a slight flow during the summer nearly all the smaller rivers and streams are either bone dry or consist only of a series of pools by the beginning of the hot season. In the early part of the year when there is still water to be seen in the streams and rivers they are a rich source of wildlife, and there are certain species of animals and plants that are specially adapted to take advantage of the water for the limited amount of time that it is available to them. Many of the reservoirs in the Algarve add to the scenic beauty of their surrounding areas, but they are no substitute for the widllife habitats which existed in the rivers that feed them before the flows were so badly diminished. It takes a very long time for the margins of reservoirs to become colonised by the emergent plants that are essential before other wildlife species will visit or live in them. Once good-sized reedbeds become established in the margins of these reservoirs they become much more valuable as wildlife havens and of considerably more interest to the naturalist. 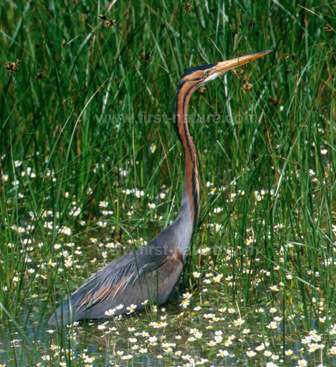 As with nearly every wildlife habitat in Algarve the best time to visit rivers and lakes is in the spring. Water flows are at their best and many of the rivers are literally carpeted with Water Crowfoot species. The river margins are lined with rich growths of plants and shrubs. Broom is common as is Oleander with its deep pink flowers. It is a tough plant (and poisonous) which is also frequently seen lining motorway central reservations and in gardens. The wet margins of rivers and streams are particularly good places to see the lovely Paper-white Narcissus (Narcissus papyraceus) which are often in flower during Christmas-time and persist well into the New Year. They are popular with flower-pickers but are seldom picked twice as they emit an unpleasant and rank scent especially when confined to household spaces. Frogs love the security of the Water Crowfoot beds and set up a deafening chorus of croaking in springtime. Because water is at such a premium the tadpoles of the Mediterranean frog species grow at an amazing pace so that they are able to survive on land by the time the water flows cease. They, and fish fry, make ideal food for the many spring migrant birds that visit the rivers on the journeys to their breeding grounds. They are also targets for the Grey and Purple Herons which wait patiently in the shallow river margins for food to head in their direction, as well as Kingfishers. 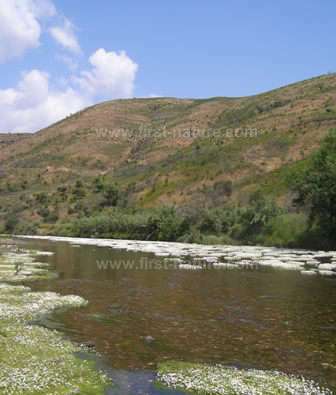 Good places to visit to enjoy some of the freshwater habitats are Fonte Benemola in the central part of the Algarve, and the drive along the road between Portimao and Silves, which runs along the River Odelouca, has plenty of places to stop and enjoy the river. If you plan a trip to Parque Natural do Vale do Guadiana there is an impressive waterfall called Puolo do Lobo on the River Guadiana about 30 kilometres from the town of Mertola.